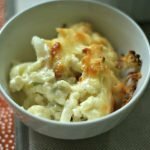 Low Carb Cheesy Cauliflower Casserole- an easy, cheesy keto side dish! 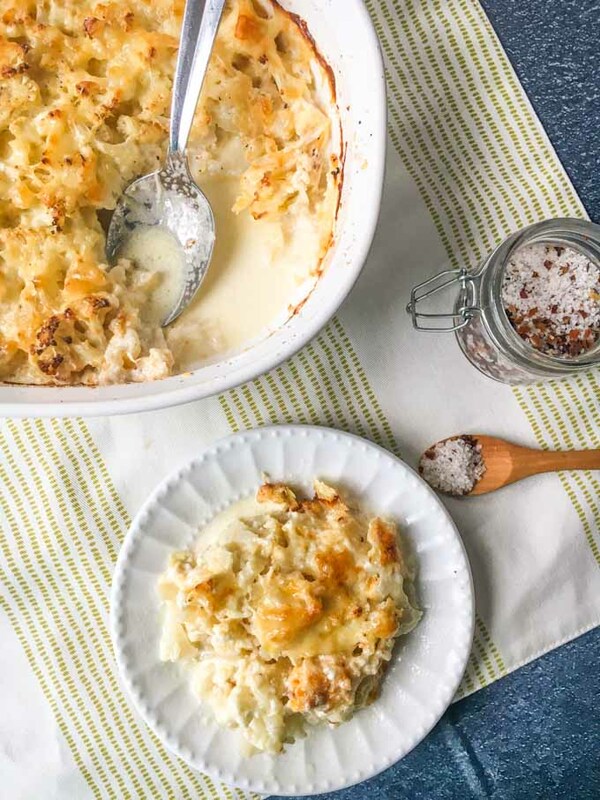 Enjoy all the comforts of a cheesy scalloped potato dish using cauliflower instead! 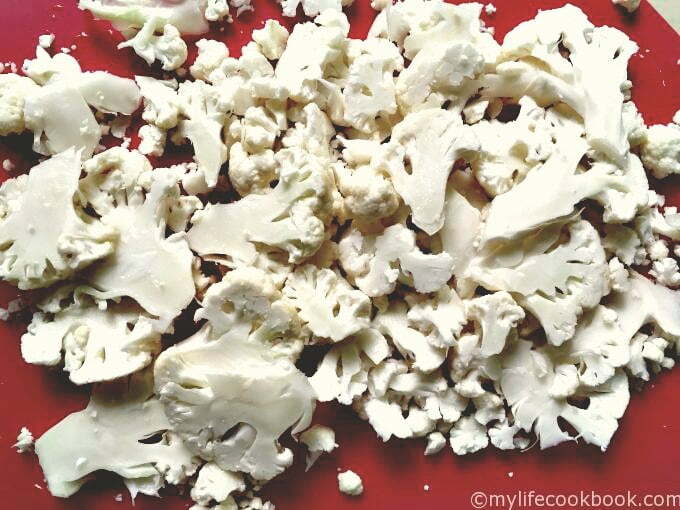 This low carb cheesy cauliflower casserole has only 1.8g net carbs and super easy to make. You might also like this cheesy broccoli cauliflower rice as a side dish! Winter is coming. And with winter weather approaching I’ve already started making casseroles and roasts and soups and stews. To me there is nothing better than a good cheesy, rich casserole to warm your hearts and bellies on a cold winter day. However since I like to keep the carbs down, I forgo the rice, pasta and potatoes and use substitutes. I still use the cream, butter and cheese though! 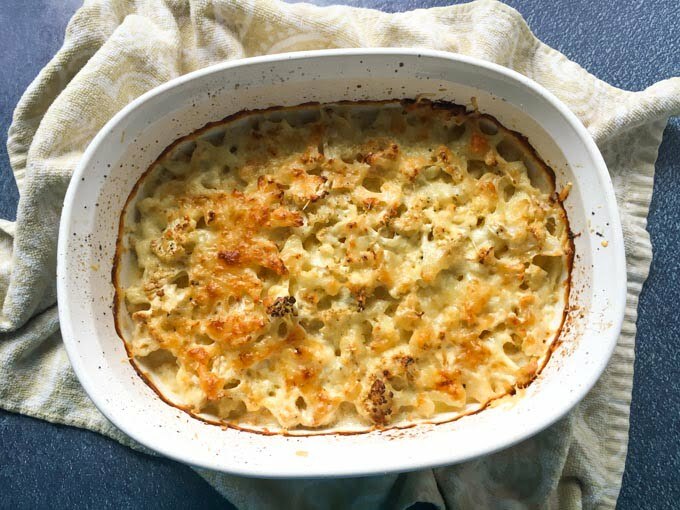 Especially in this creamy, low carb cheesy cauliflower casserole. 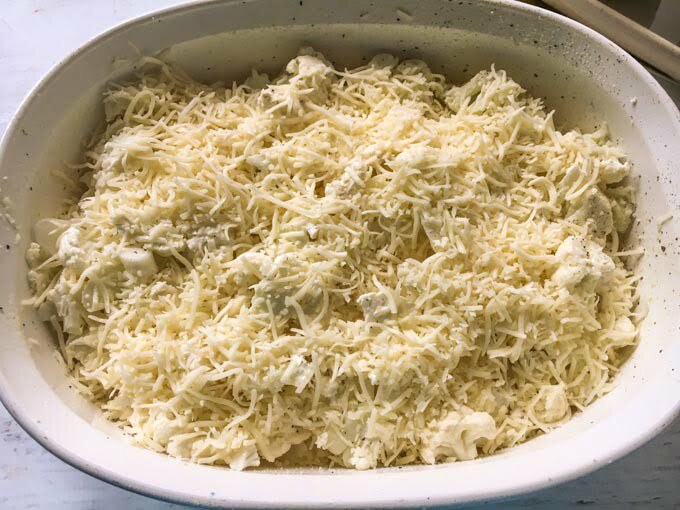 For this low carb cheesy cauliflower casserole I like to use Gruyere cheese. Aldi now has it almost all the time but if you can’t find it, try Swiss cheese. 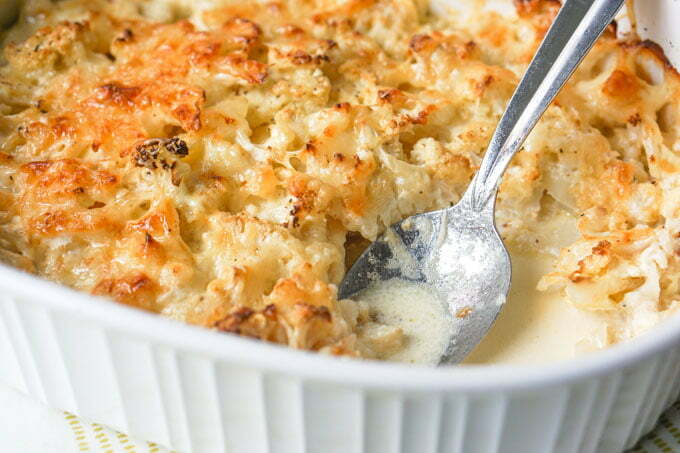 Along with the heavy cream the Gruyere has a special taste that sets it apart from other casseroles. The first time I made these I did so in a muffin tin and they were soooo good. However they looked terrible and since I had enough time, I remade them in a baking dish. And while they were very good, I liked them better in the tins. In the tins they get all brown and crusty around the sides and I personally find that part to be the tastiest. So if you really want them more crispy try a muffin tin, however note they can be a real pain to clean. However I am sticking to the baking dish. The most recent time I’ve made these I just made them in the baking dish above. I increased the cooking time and I got all that good crusty parts on the top. Now let’s get to the recipe. I used a mandolin like this to cut my head of cauliflower into thin pieces to make it layer more easily. You can just use a knife if you wish. Try to cut them evenly though. Once you have your ingredients lined up (cauliflower, cheese, salt, pepper, green onions and cream) you start to layer them. Remember to spray your muffin tins or baking dish first. Start with the cauliflower, then the cheese, green onions and salt and pepper. I only used salt and pepper on one layer in the middle. Then repeat layers but on the last layer, add the cream before the cheese. Bake until golden and delicious! Is this a keto casserole? If you are following a keto diet as opposed to a low carb diet the macros for 1 serving of this cauliflower casserole is: 81% fat / 14% protein / 5% carbs which I would consider keto as well as low carb. This creamy casserole is very rich so a large baking dish makes a lot. You only need a small amount to be satisfied. This will be great for the fall and winter months. 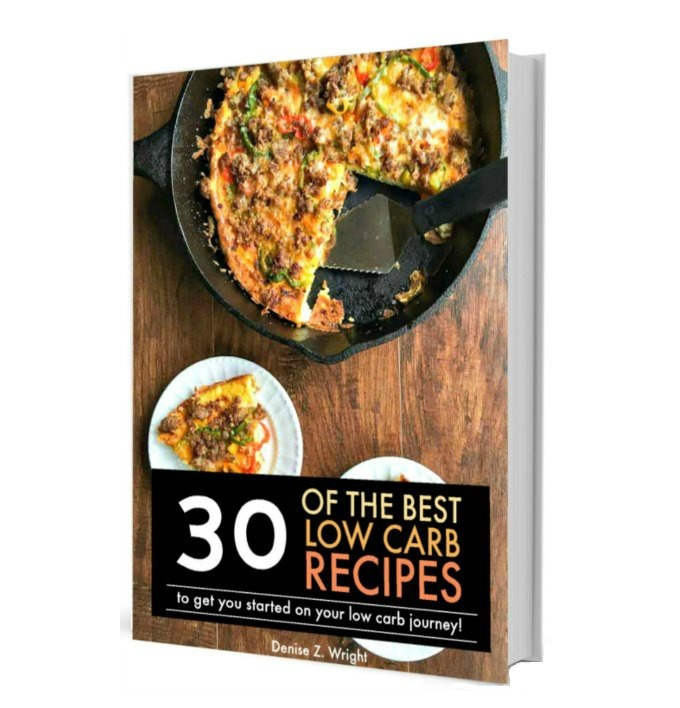 It’s pure comfort food if you are on a low carb diet and even if you are not. 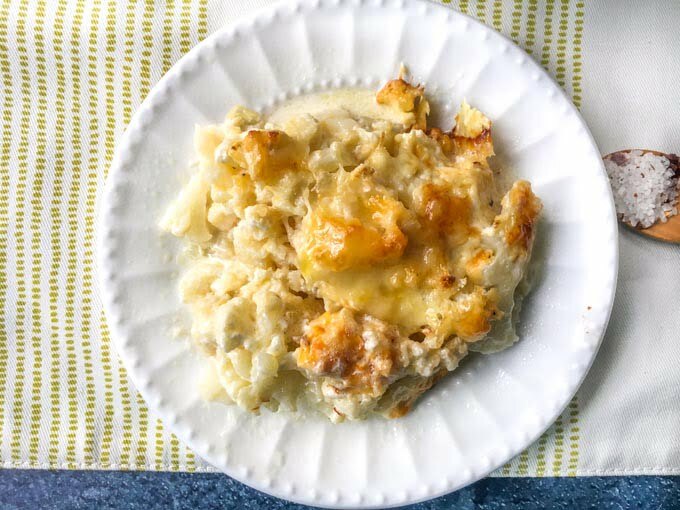 Enjoy all the comforts of a cheesy scalloped potato dish using cauliflower instead! 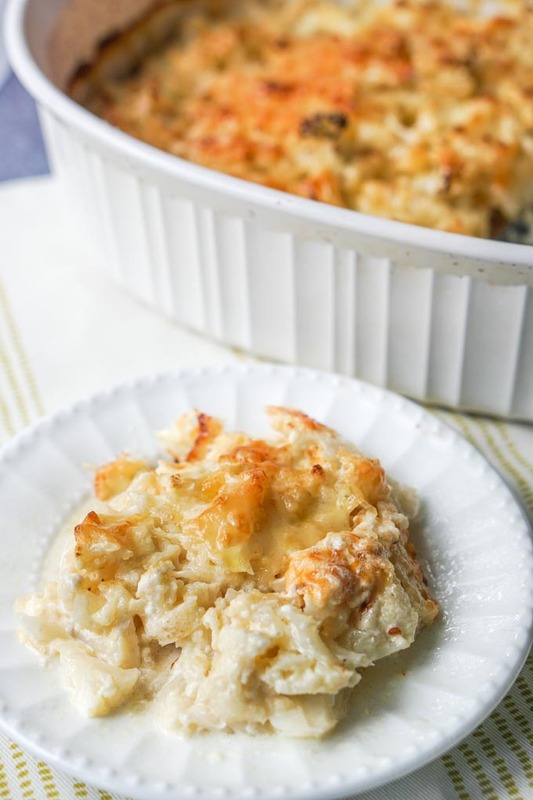 This low carb cheesy cauliflower casserole has only 1.8 net carbs and super easy to make. Spray baking dish with cooking spray and then add a layer of sliced cauliflower. This takes about 2 layers so use half of the cauliflower. Next add half of the shredded Gruyere cheese. Add all the green onions evenly on the cheese. Add the rest of the cauliflower evenly layered. Pour the cream all over the cauliflower and top with the rest of the cheese. Take off the foil and cook for 40 minutes until the cauliflower is soft and the cheese is brown. Let sit for 5 minutes to thicken. Previous Post: « Easy Lemon Butter Pork Tenderloin – a low carb skillet dinner! The first time I made it, it was very watery, but delicious. The second time I made it, I roasted the cauliflower for 10 min at 400 and it steamed some of the water out of the cauliflower. I let the cauli sit and cool for an hour before I assembled the casserole and also only baked 30 min uncovered at the end. I broiled the cheese to crisp it up. It was perfect. Hi, thanks so much for coming back and sharing your tips! I have not made this for awhile but I’ll try some of your suggestions. Glad you liked it! I made it and it came out very milky. Hi Maria, I haven’t made this in awhile but perhaps there was water that released from the cauliflower. I will try it again today and let you know if I have any tips or suggestions. Sorry it didn’t come out how you expected. I’ll get back to you by the end of the day. Mine did to but after sitting on a buffet for awhile it thickened up…. A lot. Hi Janna, Thanks for commenting and letting us know. I made it again and it was a bit watery but I thought maybe if I cooked it longer it would thicken it up. Anyway, I appreciate your input! You are right. This recipe is not Paleo. I’ve been following Primal / Paleo diets for more than 5 years now and I’ve slipped down the slippery slope of eat dairy products. While that is not Paleo it has become more accepted in Primal eating if you are tolerant to dairy. (http://www.marksdailyapple.com/dairy-fat-healthy-paleo-primal/#axzz3ml4S1vTe). Thank you for bringing this to my attention. Yes it is. There isn’t one, all-encompassing rigid set of paleo rules. If you don’t tolerate dairy, don’t consume dairy. This dish looks delicious, I will have to try it!